April 2015 n Performance & Hotrod Business n 87 April 2015 n PRECISION ENGINE n 7 a mere 20 minutes or so of dial-in/tuning time. It's important to consider that all of our runs were made with Edelbrock's Performer heads in out-of-the-box bolt- on state. Scott noted that while these heads did an outstanding job, with a bit of his custom cylinder head porting and playing with timing and additional EFI tuning, he was firmly convinced that hitting 700 hp would be no problem at all. I must admit that I've always been a carb guy from a standpoint of tradition, simplicity and old-school appearance, but after seeing firsthand how relatively simple it was to adapt this EFI system to our little punched-out Mopar, I think that I've become a convert. 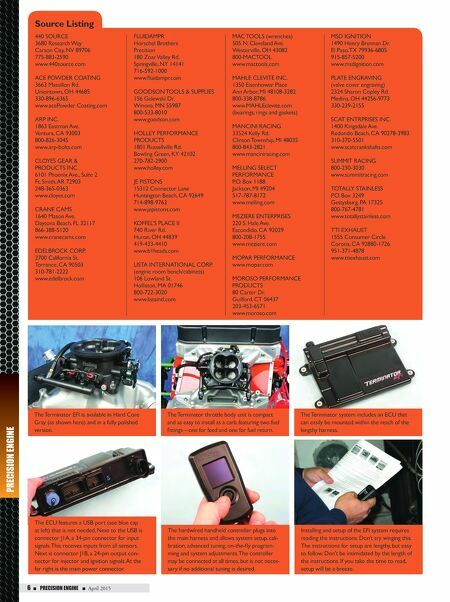 Holley's new Terminator EFI is a killer system in terms of efficiency and perfor- mance, while retaining a carburetor-like appearance, and it's tunable on the fly, thanks to the handheld programming controller. Mike Mavrigian has written thou- sands of technical articles over the past 30 years for a variety of automo- tive publications, in addition to writing nine automotive technical books for four different publishers. Mike also owns and oper- ates Birchwood Automotive in Creston, Ohio, where he builds custom engines, street rods and performs vehicle restorations. Mike can be reached at 330-435- 6347 or birchwdag@frontier.com. Birchwood's web- site is www.birchwoodautomotive.com. After switching to the Holley Terminator EFI, and with timing still at 34 degrees, we gained 13 more horses and 5 more foot-pounds of torque. Our fi- nal pull netted 657 hp at 4,800 rpm and 642 foot- pounds of torque at 4,900 rpm. Scott is certain that with a bit of head porting and additional tim- ing, hitting 700 hp would be no problem. Not bad for a little street motor. Our final dyno run with Koffel's in-house carb and with timing at 34 degrees. Max horsepower was 644 at 4,800 rpm, and max torque was 637 foot-pounds at 4,900 rpm. The controller's main menu features selections in- cluding Gauges (a graphic view of various sensor readings), Monitor (numeric views of sensor read- ings), Wizard (creates base calibration and performs TPS setting), Tuning (for adjustment of various pa- rameters), and File (allowing you to load and save numerous calibration settings). The amount of infor- mation available on the controller is amazing. Digital Spring Tester/Measuring Combo, 66842 Spring Tester/Measuring Combo, 66841 Black Crinkle Bowtie Breather Cap, 141-614 Billet Aluminum Overflow Canister, 69528 ProformParts ProformParts NEW PARTS! 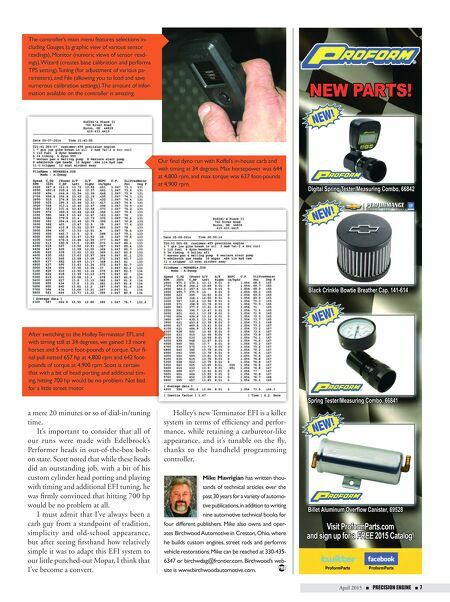 Visit ProformParts.com and sign up for a FREE 2015 Catalog!